Char-Broil’s entry-level outdoor T480 gas grill has been designed with affordability and ease-of-use in mind. Powered by refillable propane canisters, this 48,000 BTU grill features four stainless-steel burners, a 10,000 BTU side burner, and a convenient electronic ignition system. A black porcelain and steel fascia provides all of your temperature-control dials on a wipe-clean surface. The built-in temperature gauge is designed to help you keep a constant cooking temperature across all 480 square-inches of the cooking grill, and 205 square- inches of the swing-away warming rack. Each rack is constructed from durable and easy-to-clean stainless-steel. The whole cooking unit is mounted on a metal frame, with eight-inch wheels fixed to the bottom to provide easy maneuverability across a variety of surfaces. A good set of instructions should provide a list of tools that you need to assemble the item, be clear and easy-to-follow, and provide a customer service number should you need additional help assembling your purchase. Char-Broil’s instructions, in this case, only provide the latter. Fortunately, the customer service you receive is excellent, and they provide all the further support you could possibly need. There aren’t many parts to put together. In fact, it’s mostly constructed for you, but some customers have reported that it took them well in excess of an hour to put the unit together without the support of Char-Broil’s customer services department. Sadly, some of the parts seem to be of sub-standard construction: Many customers have reported that the screws strip easily, leading to the unit being a little bit on the shaky side upon assembly completion, and others have stated that the parts are flimsy and not very durable. Aesthetically, it ticks all the right boxes. A smart-looking, wipe-clean, black porcelain fascia accentuates the four sturdy temperature-control dials. The unit is compact and looks fairly durable, and a hinged door conceals the unsightly propane tank and tubes. It has a modern look that seems to have been designed for light entertaining. The Char-Broil T480 is simple to use. The automatic ignition system makes firing up your grill a snap, and the cooking area’s four quadrants get to your desired cooking temperature surprisingly quickly. The four burners (one in each quadrant) are controlled by individual dials meaning that you can conserve fuel by only lighting the quadrants you need, which is ideal if you’re cooking a meal for one or entertaining a few guests. If you are entertaining, the swing-away warming rack helps keep cooked items warm without overcooking them, and the side-burner is useful for warming non-grillable items like beans, cornbread, or creamed corn. The sturdy stainless-steel grilling racks have spokes that are close together, minimizing the occurrences of food sliding through and into the flames. Unfortunately, many consumers have found that the Char-Broil T480 provides uneven heat across the four burners and that the built-in temperature gauge stops being accurate after only a couple of uses. 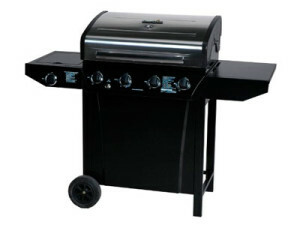 Without daily cleaning and maintenance, the unit rusts easily, and customers have reported that the burners and ignition systems break quickly, and others have said that they experienced regulator problems within two months of buying a grill. The grease-tray is non-removable, meaning that all the grills and burners need to be removed before you can clean it, making cleaning a bit of a chore. A final complaint is maneuverability. Although the Char-Broil T480 comes equipped with eight-inch wheels, customers have said that they are flimsy and break off far too easily. If you don’t mind performing regular maintenance of your grill, the Char-Broil T480 provides solid value for money. Cleaning the unit thoroughly after each use, and keeping it dry under a grill cover or in a garage between uses will increase its longevity. Consumers who follow the manufacturer’s care and maintenance instructions report that the burners are easy to control, the temperature gauge is accurate, and the quality of heat is even. They also state that the unit is sturdy and durable. Cleaning the grill trays with a wire brush, and drying them thoroughly after cleaning, helps to prevent premature rusting. Overall, owning a Char-Broil T480 and getting it to perform well seems to come down to one factor: Look after your things properly, and they will serve you well.